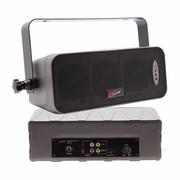 This powered array speaker enhances presentations with superior sound. Array speaker technology focuses the sound pattern more directly at the audience with a narrower dispersion angle. This makes for a clearer and more evenly balanced message by not bouncing its sound off walls, so it doesn’t contribute to existing ambient noise levels. Single 3.5mm input enables connecting audio from smartphones. Fixed & variable line-outs for adding speakers and other connected capabilities.